One of India's tallest waterfalls, Jog Falls is simply a landmark that you cannot miss. Amazing views, a brilliant trekking trail, and the perfect road trip destination with the squad or fam, you won't mind us calling it the best waterfalls too. If you have lived long enough in Bangalore, you will probably know that Bangalore's backyard is filled with some amazing waterfalls for you to check out. Of the lot, Jog Falls is the best waterfalls in Karnataka (some might say country too) since it checks all the boxes of what makes a waterfall great. First off, the drive to the falls is an eight-hour road trip that you can take with your gang and you will hit up Shimoga, one of Karnataka's hidden utopia. 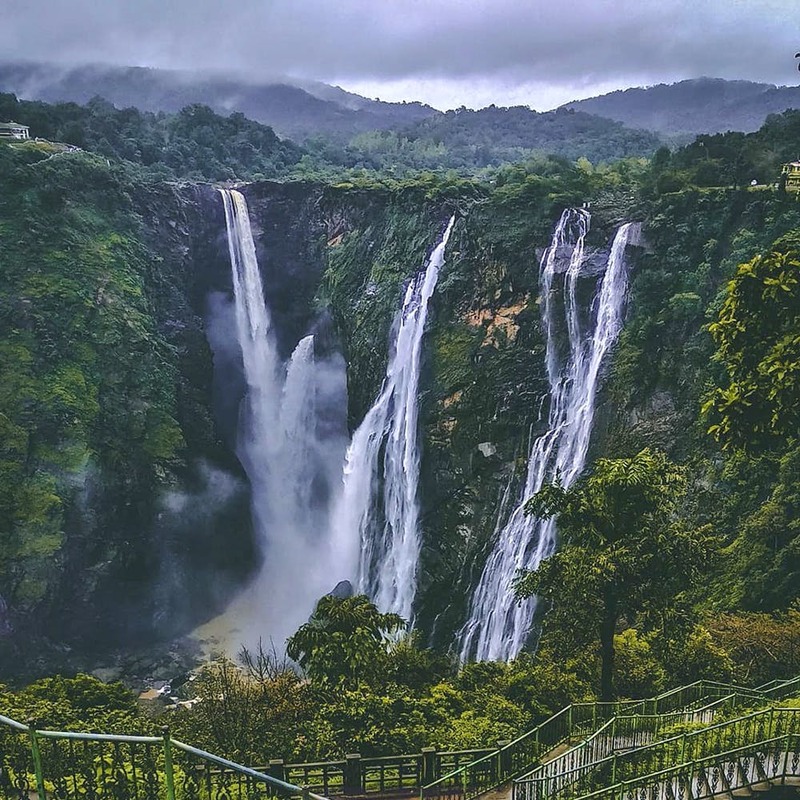 Second, the River Sharavathi that plunges from a height of 830 feet into the four cascades (Raja, Rani, Roarer, and Rocket) that forms the glorious Jog Falls. Third, the wonderful trail from the viewpoint to the bottom of the hill will have you scaling some 1000-odd steps to where you can see the waterfall from the opposite side. And finally, the view. That's what you are coming for. Trust us and the countless videos and Instagram stories and posts, it's something truly magical. If you are going during the peak season, the monsoons, then what you have are the four falls gushing down furiously and spraying you with a fine mist. Almost like you are at Niagara Falls. There's mist all around, the greens are alive, and rainbows. Yes, if you are lucky, you might even catch an elusive double rainbow on a clear day. On the way to Jog Falls, you can check out Honnemaradu that overlooks Linganamakki Reservoir. It's formed by the backwaters of the Sharavathi and you can go camping here and go coracle riding.